Before we get into today's recommendations, it is important to remind everyone to understand your scoring format and the pricing of the individual players on the site you're playing. These vary from site to site and all daily sites price their players differently, which could make someone a must start on one site but not another. In the space below I will break down the best and worst plays by position and make notes as to which type of formats to utilize players. If you are new to the daily fantasy baseball scene, there are daily fantasy websites which offer one day contests. These contests are mostly salary cap games where you can take any players you want as long as you stay under the cap and meet the positional requirements and all are points-based (not roto). As a result these recommendations often focus on value. By reading the notes below you'll be able to identify not only value options but potential weak pitchers to exploit. If a player is not touched on, it doesn't mean they're not a good play. We have limited space and assessing value across all the sites is a bit subjective. Please feel free to e-mail me at ddinkmeyer@fantistics.com if you have any further questions regarding daily fantasy baseball. Weather: Early weather reports suggest the DET-ATL game is the only one with potential issues. Given it's a Sunday night game owners might want to play it safe. Miguel Montero (ARZ) - Montero has to be amongst the most consistent disappointments in this space, but I'm going to keep running him out there against below average RHP. Jon Garland qualifies as he's allowed a .337 wOBA, 20% LD Rate, and 1.09 HR/9 to LHB's over the last three years. 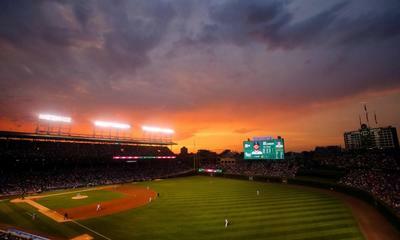 Montero has hit .278/.358/.458 in his career and Chase Park is an elevated run-scoring environment. Montero is probably the strongest value play of the day, you'll just need to confirm he's in the lineup which Kirk Gibson has had an annoying habit of posting lineups very late on Sundays. 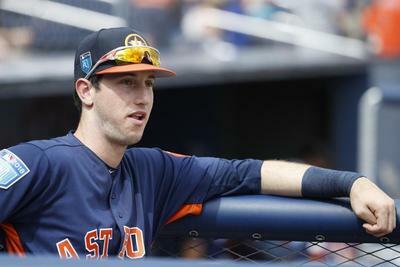 Jason Castro (HOU) - Castro has been an under the radar option against RHP in his career. He's hit .272/.351/.417 with a strong 11% BB Rate and 25.4% LD Rate. On Sunday he'll likely draw the start against John Lackey who has surrendered a .373 wOBA and 22.6% LD Rate to LHB's over the last three years. Fenway Park is an especially strong park for left-handed line drive hitters who can flick the ball off the green monster and use the big gaps in RF to their advantage. Castro has been hitting in the 3rd spot consistently against RHP and should be a fine value play on Sunday. 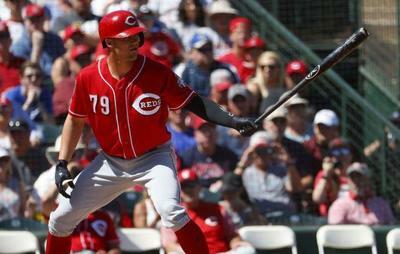 Devin Mesoraco (CIN) - In his brief career Devin Mesoraco has really hit LHP well (.362/.413/.517, 0.71 EYE). On Sunday the Reds get a matchup with Ross Detwiler who has been a pretty good LHP but has been just average against RHB's (.322 wOBA, 20% LD Rate). Mesoraco has been hitting 8th so the upside is limited but on sites that deduct for outs made, Mesoraco's strong OBP against LHP makes him a fine value play. Yadier Molina (STL) - Yadier Molina gets a matchup with the worst pitcher of the day Jeff Locke. Locke has allowed a .356 wOBA to RHB's in his career which includes allowing 1.81 HR/9. Molina has posted a .764 OPS vs. LHP in his career but of late he's been a monster. In 2012 he posted a 1.021 OPS vs. LHP and in 2011 it was a .842 OPS against lefties. Yadier very rarely gets days off but when he does they're usually on Sundays. If Molina does rest, Tony Cruz would be a viable value play as well. The Cardinals offense should put up plenty of runs against Locke. Wilin Rosario (COL) - Rosario was on our list yesterday and delivered with a HR. He crushes LHP and Patrick Corbin has allowed a 22% LD Rate and 1.19 HR/9 to RHB's in his brief career. Chase Field is a strong run-scoring environment, especially for RH power. The one risk with Rosario is that he caught Saturday night so there's a good chance he rests on Sunday. With the late game you might not be able to take the chance. Buster Posey is also a fine play against Jason Marquis who is atrocious against LHB's but not great against RHB's either (.329 wOBA). Allen Craig (STL) - Craig's slow start to the season has him priced as an average 1B across sites and the matchup with Jeff Locke is a great one to exploit. Locke has allowed a .356 wOBA to RHB's with a 11% BB% and 1.81 HR/9 over the last three years. Craig has hit .319/.356/.585 in his career against LHP and the Cardinals figure to be one of the higher scoring teams on Sunday's slate. If you can get Craig for a discounted price jump on it. Brandon Belt (SF) - Jason Marquis has given up a .385 wOBA and 1.73 HR/9 to LHB's over the last three years. Brandon Belt has actually been modestly better against LHP than RHP in his career (.723 OPS vs. RHP, .807 OPS vs. LHP) but Marquis has been so bad against lefties and Belt's LD skills should play well in the big gaps in PETCO. He's a strong value play on Sunday. Eric Hosmer (KC) - Hosmer has really been seeing the ball well of late as he had a 4-game hitting streak snapped last night but was lining rockets at defenders all night. On Sunday he'll get to face Justin Masterson who has allowed a .344 wOBA to LHB's over the last three years. Hosmer has hit .277/.336/.452 in his career against RHP and he's been particularly great against GB pitchers (as classified by baseball-reference) hitting .322/.386/.498 against them in his career. Masterson is an extreme GB pitcher so this matchup figures to favor Hosmer. Edwin Encarnacion (TOR) - Edwin's power has come around rather quickly as he's collected 5 HR's in the last 5 games. On Sunday he gets to face Phil Hughes who is one of those pitchers we've highlighted that has reverse splits. Hughes has allowed a .348 wOBA to RHB's over the last three years and it comes with a ridiculous 1.65 HR/9. Encarnacion also has a nice history against Hughes going 9-27 with 4 2B's and 1 HR. With Edwin swinging a hot bat and Hughes historically struggling against RHB's, Encarnacion makes for a strong play on Sunday. Kelly Johnson (TB) - Johnson's offensive production has started to pick up and it may have peaked last night with a 4-5 effort. On Sunday he'll face Dylan Axelrod who allows 1.27 HR/9 and walks 10.6% of the RHB's he's faced over the last three years. Home runs and walks are kind of a big part of Kelly Johnson's game against RHP (11.9% BB%, .178 ISO) and US Cellular is one of the better offensive scoring environments in baseball. This is a good alignment of skills for Johnson and with his price still depressed he's one of the few value plays at 2B. Jason Kipnis (CLE) - Same stuff we've been writing the last few days about Kipnis. He's solid against RHP (.272/.345/.443) and the opponent on the mound on Sunday (Jeremy Guthrie) has allowed a .349 wOBA to LHB's and 1.42 HR/9 over the last three years. Priced like an average 2B on most sites, Kipnis still possesses Top 5 offensive upside at his position. He's a nice value. Danny Espinosa (WAS) - You have to check pricing here because some of the sites that are quicker to adjust have bumped Espinosa up after his big game earlier in the week. Espinosa is WAY better as a RHB (.350 wOBA) than as a LHB (.304 wOBA) and he's a particularly good fastball hitter from his natural side. Tony Cingrani has been incredible early on but he's given up 2 HR's to RHB's in his first two starts and his .332 wOBA allowed to RHB's is just below average. Given Espinosa's history and the fact Cingrani throws about 80% fastballs I think this is a good matchup for the young National. 2B is a position with such few values right now that you're encouraged to spend. Robinson Cano gets R.A. Dickey who has been homer prone and Cano is always a great play in Yankee Stadium. If he's priced similarly to the other elite 2B he'd be my choice. Ian Kinsler would be next against Kevin Correia who has some reverse splits and generally isn't very good. Dustin Pedroia has been great at home and the Red Sox have been tattooing Astros pitching all around Fenway, so he's a fine play as well. Brandon Phillips is a solid play against Ross Detwiler since Phillips hits lefties well but he's a clear step below the Top 3 in my opinion. Starlin Castro (CHC) - Castro continues to be priced below his talent level. The matchup isn't ideal as Ricky Nolasco allows just a .310 wOBA to RHB's, but the high LD Rate allowed suits Castro's bat skills. He's worth consideration on sites where he's priced as a below average option. Stephen Drew (BOS) - Drew has hit .272/.338/.442 in his career against RHP and Sunday's opponent Bud Norris has allowed a .353 wOBA to LHB's over the last three years. Drew hasn't been particularly good of late against any type of pitching, but he does seem to see Norris well. He's gone 5-9 in his career with 3 BB's, 0 K's, and 2 2B's. If Drew is going to snap out of his funk against anyone it's probably a RHP he's had previous success against. Given the Red Sox propensity to light up the scoreboard at Fenway, Drew is a solid cheap option to get exposure to their offense. Asdrubal Cabrera (CLE) - Asdrubal, like Starlin Castro, is better against LHP and like Castro he's also way under-priced for his talent level. The career .741 OPS against RHP is competent and starter Jeremy Guthrie has allowed a .349 wOBA and 1.42 HR/9 to LHB's over the last three years. You could do worse than betting on Cabrera's talent in a favorable matchup. If you're really hunting deep Cliff Pennington has posted a sub-.700 OPS in his career against RHP but is getting Jon Garland (.337 wOBA to LHB) in a favorable hitting environment. I prefer Stephen Drew to him who is similarly priced but the play wouldn't bother me if you were punting salary at SS. Troy Tulowitzki (COL) - Oddly it seems like some of the sites that price via splits are offering a discount on Tulowitzki vs. LHP. I can't really figure out why since Tulo has been better in his career against left (.917 OPS) than right (.854 OPS). Patrick Corbin has been throwing really well this year but for his career he's allowed a 22% LD Rate and 1.18 HR/9 to RHB's. If I can get Tulo cheaper than I usually do against LHP in a strong offensive environment I'm going to take my shot. Just be sure that he's in the lineup as he's gotten a few Sunday's off this year. David Freese (STL) - Freese is one of the few STL bats that you can get your hands on for a very nice price and on Sunday I think you're going to want as many STL bats as you can get your hands on. Freese has hit .321/.382/.459 in his career against LHP and the opponent on Sunday, Jeff Locke, has allowed 1.81 HR/9 to RHB's to go with a .356 wOBA. It will be hard to pass up the value on Freese on many sites. Eric Chavez (ARZ) - Chavez has been a nice cheap filler against RHP of late and on Sunday with Jon Garland on the hill just one day after the DBacks faced a lefty, I envision Chavez will be back in the lineup again. Chavez is up to .256/.319/.488 on the season against RHP and for his career he's posted an .855 OPS against righties. Chavez's history against Garland is pretty old but he has seen him well when he's faced him (7-32 2 HR's, 7 BB's, 2 K's) despite having limited success. The strong BB:K Ratio suggests he saw him pretty well. For near the minimum on a number of sites Chavez is a fine option to plug in if you're looking for salary relief. Mike Moustakas (KC) - Moustakas has really been scuffling this year (.152/.222/.197) but many of his peripherals suggest he's showing improved plate discipline, contact rates, and he's hitting way more balls in the air which theoretically should translate to more power. On Sunday he'll face Justin Masterson who allows a .344 wOBA to LHB's and presents a great matchup for Moustakas. I prefer the other two ahead of him if he's priced similarly so I probably won't own Moustakas anywhere but I think he's a solid play. Brett Lawrie (TOR) - Lawrie appears to be coming on of late as he's homered in 2 of his last 3 games and he's stopped striking out multiple times a game as he was in his first week back. On Sunday he gets matched up with Phil Hughes who has been very homer-prone to RHB's (1.65 HR/9) and Lawrie has actually hit for way more power in his career against righties than lefties (.178 ISO vs. .127 ISO). Lawrie's a high risk/high reward play because of his contact issues of late, but I think he's a strong one for those playing in big tournament play. Miguel Cabrera is the premier 3B play of the day as he gets to face a LHP in Mike Minor. David Wright has had a lot of success against Cole Hamels in his career and Adrian Beltre gets to face a RHP with reverse splits in Kevin Correia. Evan Longoria is also swinging the bat extremely well and Dylan Axelrod isn't exactly tough on RHB. I'd put Longoria ahead of Beltre with Miggy and Wright a bit ahead of the two of them if all are priced similarly. I'll have a hard time passing up the value on Freese though on most sites. John Mayberry Jr. (PHI) - Mayberry is always in the middle of the Phillies order when they're facing LHP because so many of their top bats are LHB's. In his career Mayberry has hit .281/.328/.542 against LHP and he's particularly had great success against Jonathan Niese. In 28 career AB's against Niese Mayberry has launched 3 HR's and picked up 2 more 2B's while posting a .321/.310/.714 line. The Phillies don't figure to be one of the highest scoring offenses on Sunday because as a whole they don't hit LHP well, but Niese allows a .321 wOBA against RHB's and particularly struggles against Mayberry. Hunter Pence (SF) - Jason Marquis is at least tolerable against RHP (.329 wOBA) but he struggles to pitch away from solid contact (20.2% LD Rate allowed) and Hunter Pence has a tremendous individual history against Marquis. He's hit .423/.500/.769 in 26 career AB's against Marquis and he's had 5 XBH's, 4 BB's, and 4 K's. With the Giants having some left-handed table-setters in front of Pence in the order, he should get some RBI opportunities and given his history against Marquis he figures to cash in on them. Melky Cabrera/Jose Bautista/Colby Rasmus (TOR) - In his career at home Phil Hughes has allowed opposing batters to hit .263/.321/.471 for a .3545 wOBA and it comes with 1.71 HR/9 allowed. He's been a bit worse against LHB's at home because of the short porch (.356 wOBA vs. .331 wOBA), but for his career we've noted Hughes reverse splits. There is value in all of the competent Blue Jay hitters today, especially those with power. Josh Hamilton (LAA) - Hisashi Iwakuma allows just a .288 wOBA to LHB's but he does yield 1.09 HR/9 and Josh Hamilton's price is just too low across sites. Hamilton has hit .312/.377/.574 against RHP in his career and for the price of an average OF I think you have to roll the dice on his power. We've said this about Giancarlo Stanton and Carlos Beltran at different points this year that you just bet on the talent and I think Hamilton deserves that recognition as well with his price way down. Shelby Miller (STL) - Miller figures to have plenty of run support given the matchup for his offense and some sites have been slow to adjust with his incredible start to the season. Miller has posted a 1.44 ERA, 0.84 WHIP while striking out 26.8% of the batters he's faced. A little under 2 weeks ago Miller faced this same Pirates team and limited them to 2 ER's on 6 hits and 1 BB while striking out 6 over 6 innings. The Pirates have improved against RHP early in the season but they're still striking out in 22.8% of their PA's against RHP. On some sites Miller is priced as a Top SP and is probably priced appropriately, but those slow to move their pricing he's arguably the best value in the pitching market. Tony Cingrani (CIN) - Cingrani and Shelby Miller are kind of similar. Sites that are aggressive in their pricing have adjusted them up pretty quickly but there's still an advantage to be had on sites that are slow to adjust. Cingrani has struck out 35% of the batters he's faced and the Nationals have been a below average team against LHP so far this year (17th in wOBA). Much of that is with Ryan Zimmerman who is one of their better hitters against LHP and he's currently on the disabled list. Bryce Harper and Adam LaRoche are less impactful against lefties and as a result Cingrani should have continued success in his first trip around the league. Doug Fister (DET) - The Braves offense isn't quite the same against RHP without Jason Heyward. Anibal Sanchez dominated them on Friday night and Rick Porcello even limited them on Saturday. Doug Fister is one of my favorite unheralded starters as he's posted two consecutive seasons with a FIP below 3.50. He's 3-0 this year with a 2.00 ERA and his strong GB Rate (60%) really helps limit big innings. The Braves are striking out in 25.5% of their plate appearances against RHP and while they've hit for a ton of power (.175 ISO), Fister's strong GB Rates should help limit that. The matchup against the free swinging Braves is a good one for Fister and I expect another quality outing. I also think Ryan Vogelsong and Alexei Ogando are cheap on sites that allow you to use multiple SP's. Both have strong environments to pitch in (@SD, @MIN respectively) and should get plenty of run support given the opposing starters their offenses are facing. Clayton Kershaw is almost priced out of contention on most sites and the Brewers hit RHP pretty well. I'd take a pass on Sunday. Cole Hamels and David Price are both cheaper than they historically are because of slow starts and have favorable matchups on Sunday. Between the two I prefer Hamels who is facing an NL lineup with just one threatening RHB as opposed to Price who will face 8 RHB's in the White Sox lineup. 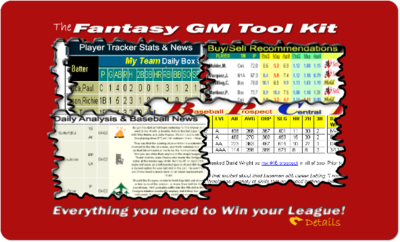 Join the DailyFantasy Fix Distribution list for daily emails.